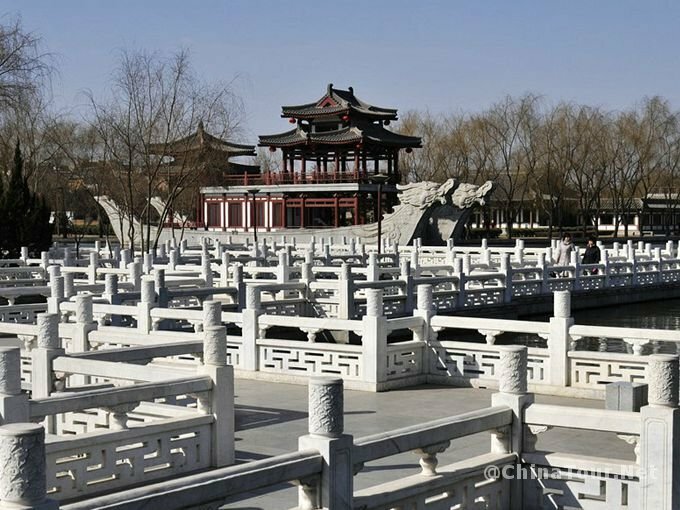 Tang Dynasty Reconstruction Project is one of the largest tourist programs in the northwest of China. It covers an area of 1,000 mu (about 165 acres) and is established with an investment of 1.2 billion Yuan. 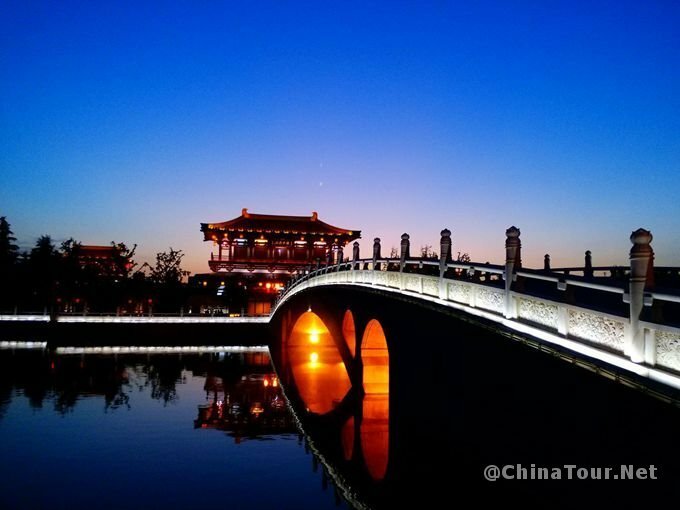 Located to the north of the original Tang Dynasty Lotus Garden site, the present Tang Paradise is the first theme park fully demonstrating the charm and grandeur of the royal garden in Tang Dynasty. 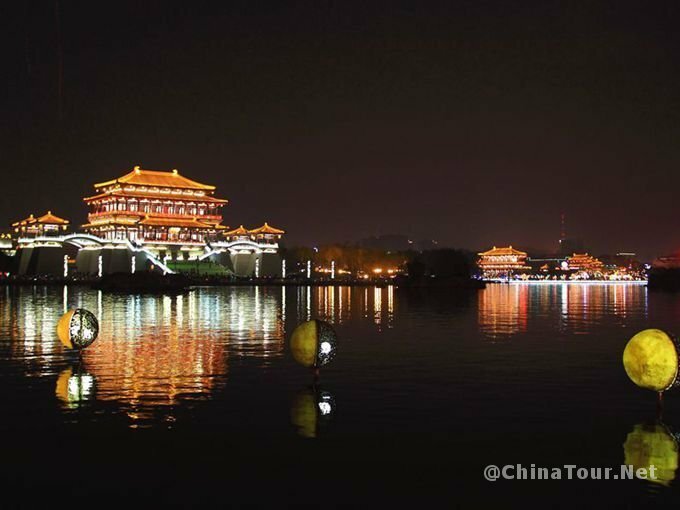 It includes the attractions of Ziyun Tower Block, Elegant Lady Area, Imperial Banquet Hall, Fanglin Fragrant Garden, Phoenix Theater, Apricot Garden, Lu Yu Teahouse, Tang Marketplace and the Floating-drink at Qujiang Lake. 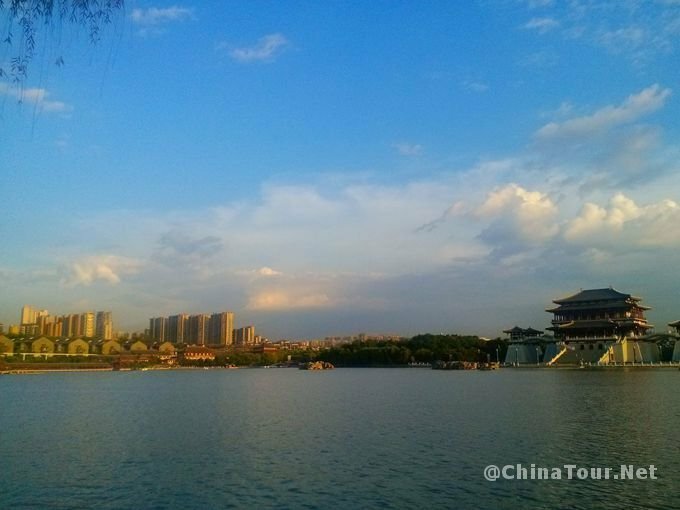 The imperial court of the Qin Dynasty established a famous royal garden by making full use of the low wetland, the beautiful mountain and the lake in Qujiang Area. 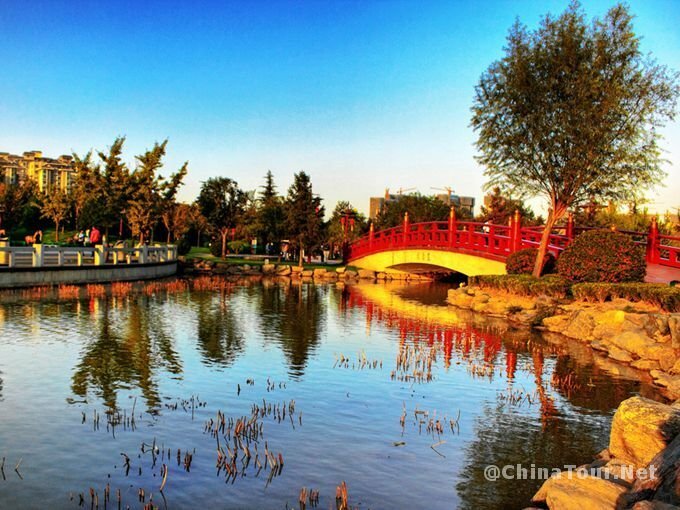 Two of the most popular parts here were Yichun Spring Garden and Le Youyuan Wonderland. 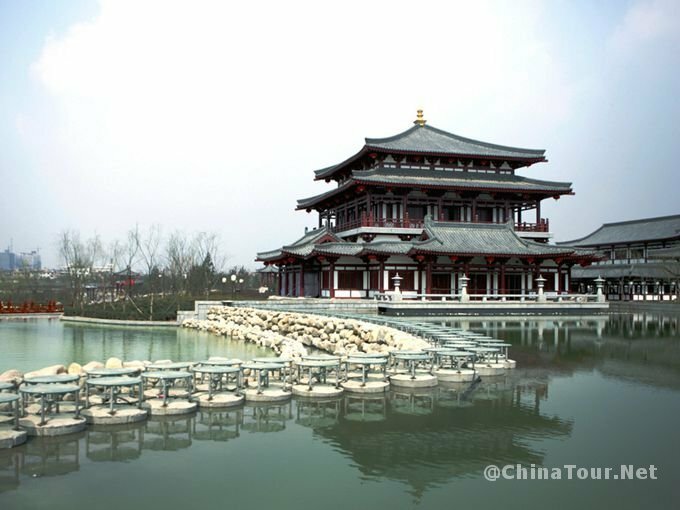 Qujiang was also an important part of Shanglin Yuan Royal Garden. 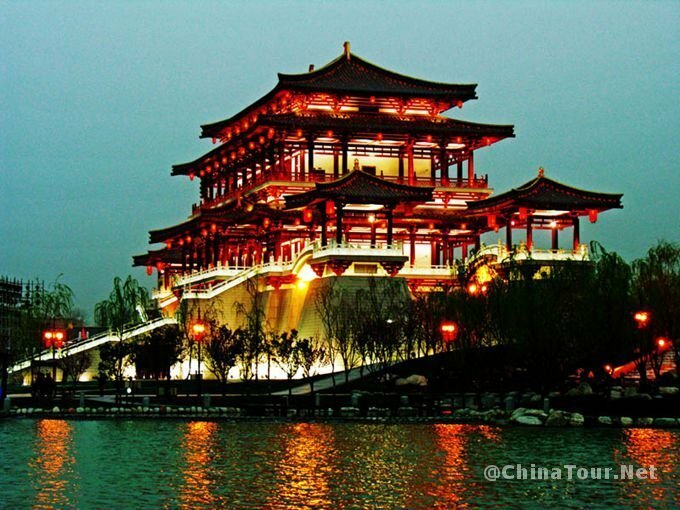 Qujiang Area went into its prosperous period in the Tang Dynasty. 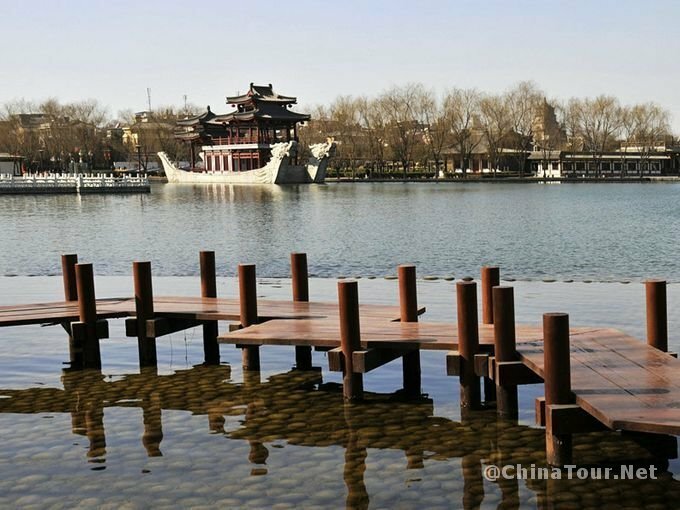 From the Qin Dynasty to the Sui and Tang Dynasties, Qujiang remained as a resort for over 1,300 years. It assembled the best ancient gardens and buildings in it. 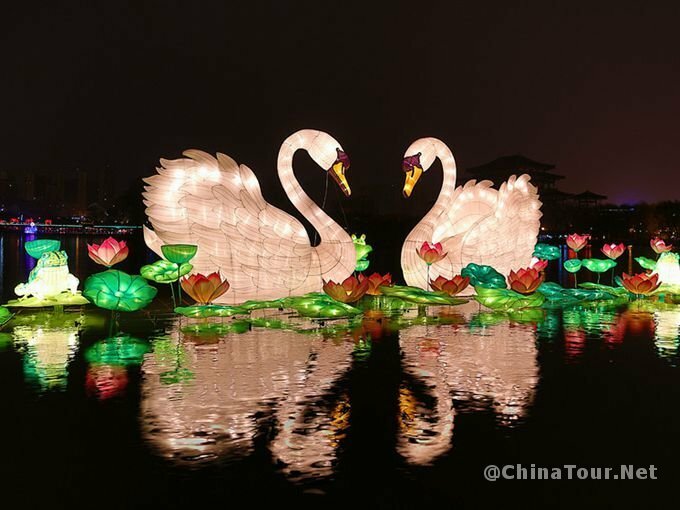 It was cut out as the royal garden area and boasted the popular attractions like the Lotus Garden, Ziyun (Purple Cloud) Tower Block, Apricot Garden, the Emperor Hanwu Spring, the Green Dragon Temple, the Da Ci’en Thanks-giving Temple and the Big Wild Goose Pagoda. Lotus Garden, was put up at the same time with Ziyun Tower Block and Caixia(Rosy Cloud) Pavilion inside. Tang Emperor Xuanzong had a walled passage leading to the garden built, with the city wall serving as one of the two walls. It was built up for him to sneak into the Lotus Garden for fun. Emperor Minghuang of the Tang Dynasty would always go at the head of hundreds of officials and concubines to Ziyun Tower Block on the day of Qujiang Fair and enjoyed the fair with local people. All the streets in the Tang Chang’an city were vacant because people were all out in Qujiang indulged in wining and dining and looking for fun. This exemplified the great prosperity of the Tang Dynasty. The Tang Paradise boasts many new records: the largest show on water screen in the world; the first theme park of five senses (sight, sound, taste, touch and smell senses); the biggest out-door fragrance project in the world and the biggest reproduction of the Tang royal garden complex in China. Tang Paradise is a comprehensive resort center which attracts people from different walks of life. 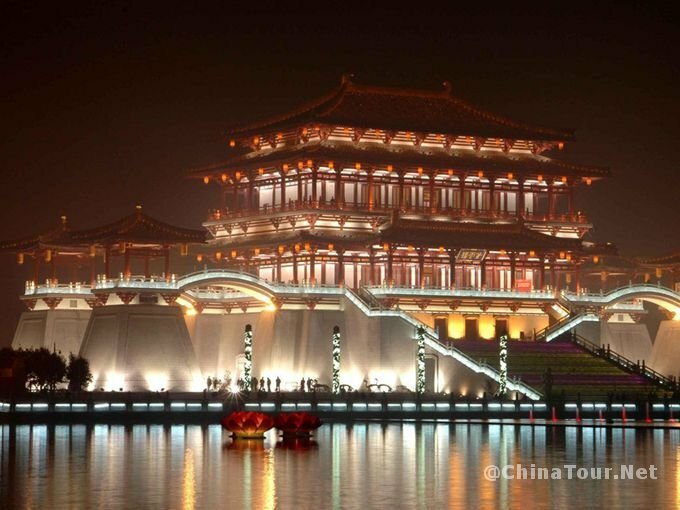 With it’s surprising charm it has become a must see attraction in Xian.